First a few things I forgot yesterday. The French team found a new (third!) American Redstart in Ribeira da Ponte where the Black-and-white and the Black-throated Green were still around to. Fred also found a Spotted Sand on the beach. First half of today was quite calm, best bird was a Red-eyed Vireo by Pete in the bottom of Fojo. All I picked up on my walkie-talkie when he found it was "...eyed Vireo" so at first I got a bit excited, but unfortunately soon calmed down again. 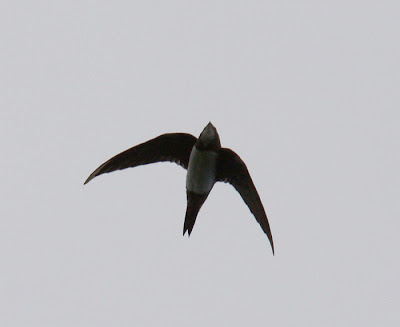 At lunch time Fred picked up an Alpine Swift over Fojo, a 1st for Corvo and 2nd for Azores. During early afternoon Darryl spotted an Indigo Bunting at Ribeira da Ponte. I was already on my way there and soon joined Darryl and Ferran who sat and waited for the bird to reappear. After ten minutes of waiting the walkie talkies went active again and soon the news broke that Pierre had found a CHESTNUT-SIDED WARBLER in Ribeira da Poso de Agua. 1st for Az and about 3rd for the WP - RUUUUUUUUUN! While we were running there news broke on the radios that Fred had relocated the Philadelphia Vireo in Ribeira do Vinte at the same time! The French and Belgians saw the Philadelphia Vireo and in Ribeira da Poso de Agua all ten of us were looking for the Warbler until dusk but all we got was a few contact calls :( Maybe we'll have better luck tomorrow when we go there together in the morning. On my way back to the village I once again missed the Indigo Bunting since I stayed too long in Poso de Agua. Winds today and tomorrow maybe can put some stuff out of course from Newfoundland...? Some nice stuff to look for tmrw - 3rd American Redstart are u sure there's not a breeding colony ? !